The pose of the sitter in this portrait is derived from models by Thomas Hudson and Allan Ramsay, in particular two portraits by Ramsay, one in the Minneapolis Institute of Arts (same pose in reverse, identical blue overcoat) and another in the collection of Viscount Clifden, Lanhydrock House (similar pose and the same silk undercoat). An attribution therefore has to be sought in the ambient of both highly popular portraitists. 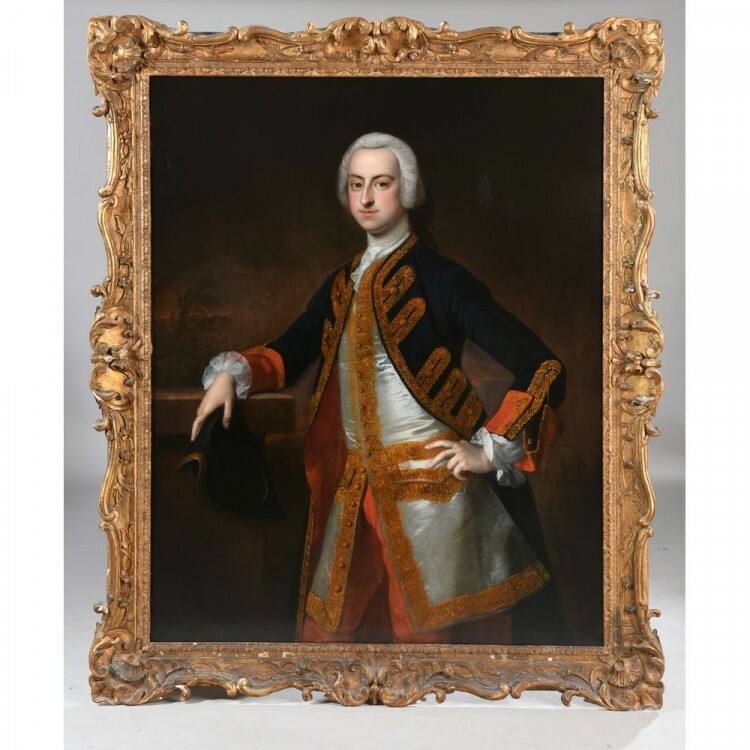 One possibility is the fashionable portrait painter John Astley (1724-1787) who was a pupil of Hudson and had a prosperous business in London and Dublin before marrying a rich widow and retiring to Cheshire. Another name is John Theodore Heins (1697-1756), of German origin and especially good at evoking fabric and texture. Our proud and expensively attired sitter, possibly a nobleman, displays all the swaggering self-confidence and wealth of the early Georgian period. The portrait spent a lengthy period in a French collection, which explains the label on the stretcher bearing the legend “Tocque”, who was one of the most fashionable portrait painters in mid-18th.century Paris, though in an idiom considerably more baroque (massive columns and swirling draperies) than the somewhat restrained Anglo-Saxon manner. Both Professor Brian Allen, ex-director of the Paul Mellon Centre, and Desmond Shaw-Taylor of the Royal Collection have kindly inspected the portrait and suggested an artist around Thomas Hudson. I am writing to enquire about "A Portrait of a Gentleman, three-quarter length, in a dark blue, gold braided coat, holding a tricorn hat, his hand resting on a stone ledge"